Since I was young, I've always loved adventure stories. Given the chance, I would love to go out and explore other parts of the world. However, as it is not currently possible, for now I seek comfort in Cookie Next Door, a unique app that allows you to take your juniors on an adventure in the safety and comfort of your living room. Instead of just reading another person's adventure, the app allows you to star in your own adventure. Cookie Next Door ~ Rainy Days is a creative app that which lets you record your own voice to narrate an adventurous tale. Cookie Next Door ~ Rainy Days is an iPad app designed as a creative sandbox for exploring your imagination as you become cast members of an animated adventure starring Cookie. 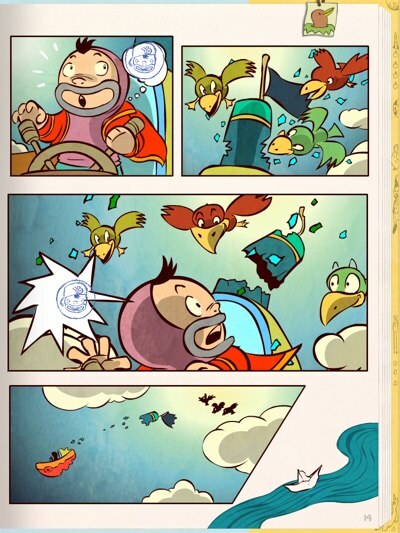 Instead of text, the app uses comic illustrations to guide the storyline and inspire you to tell the story your own way. Like a comic book page, each page in the app contains several frames. Within some of these frames, you can see empty speech bubbles containing yellow stars. These speech bubbles indicate points in the storyline that you can interact with. Tapping on the star would prompt you to record your own voice. You can speak, shout, sing, or make any sound effect that you think would fit the frame. As soon as you finish recording, the star disappears and turns into a blue Cookie stamp, indicating that you already completed that part. You can tap the stamp to hear your voice recording. If you don't like what you hear, you can always reset the recording by tapping and holding the blue stamp until it turns back into a yellow star. Then, you can redo the recording process from scratch. As you complete all the frames in a page, you unlock more pages. Once you complete your story, you can experience the entire storyline as a play projected on moving screens with dancing props to highlight the action. Language-neutral, the app lets you record in any language you like. Knowing that they have a unique app on their hands, the developers of Cookie Next Door ~ Rainy Days included an excellent tutorial within the app. It teaches you how to navigate the pages of the comic book, record your voice, and reset the recording if you don't like it. The app also allows you to set a voice pitch for each character so that you don't have to change your tone to give them different voices. The app currently only features the first episode of the series, entitled Rainy Days. The cast members include Cookie, Rainy, Big Wave, Whale, and Mysterious. No specific dates have been set for the upcoming episodes, but if you're really interested, you can get a sneak peek of new comic sketches on the developers' website. You can assign a custom pitch for each character to get different voices. I really appreciate the absence of predefined narration in this app. This allows me to create my own plot and record it in any language I like. The fact that you can also reset all the voice recordings and then start a new one, opens up the possibility to have new sets of people, perspectives, and imaginations to create wholly different stories. I also like how this app could trigger a new type of activity where you ask your juniors to interpret each scene. The absence of text really helps. All of a sudden, there is no such thing as right or wrong; it's their creativity that matter. I personally find this to be a good activity for 3-year-olds who are starting to express their thoughts more fluently. After you are done recording, you can watch your story come to life. 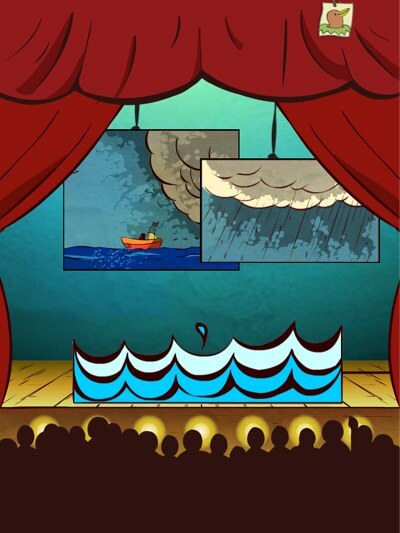 Cookie Next Door ~ Rainy Days is a unique app that allows you to record your own voice to transform a set of comic illustrations into an animated performance. I really enjoyed playing with this app with my sons, and I would recommend it to parents who are looking for apps to encourage their juniors to express their ideas and creativity. Creativium. Virtual paper sets encourage juniors to imagine their own stories.